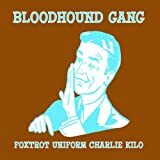 Bloodhound Gang's, "Lift Your Head Up High and Blow Your Brains Out"
This is supposed to be taken tongue-in-cheek, like most of BHG's songs. The second part of the lyric/title totally contradicts the first part. And the happy music masks the true intentions of Jimmy Pop.